When I first expressed interest in seeing Belfast back in July, Douglas the Leprechaun (who hails from said city) made a face and asked me why. After spending a few days there I’ve come to the conclusion that, compared with an outsider, we really have no idea how incredible our stomping grounds can be. From the moment I arrived in the city center—and even through the rain and various frustrations with the bus system and a currency change (remember, Northern Ireland is part of the UK and therefore uses the pound)—I was enchanted. Maybe it was the travel endorphins talking, but Belfast seemed like a fantastic city. Unfortunately, I wasn’t able to do a lot of intentional exploring that first evening because of said troubles, but I did see a good chunk of the city while stubbornly wandering around in search of my hostel. The problem was not with Vagabond’s directions; these were flawless. It was my inability to find their starting point that was the problem. Eventually I gave up and overcame my bus prejudice long enough to make it to their door, and it felt like coming home immediately. The converted house is cozy and the atmosphere is incredibly warm, and the hostel workers go out of their way to make you feel included and comfortable. They took everyone out to a local club and partied with us until it shut down (at a tame 2:00 a.m.), and even though the music was questionable for dancing, we all bonded and had a great time. 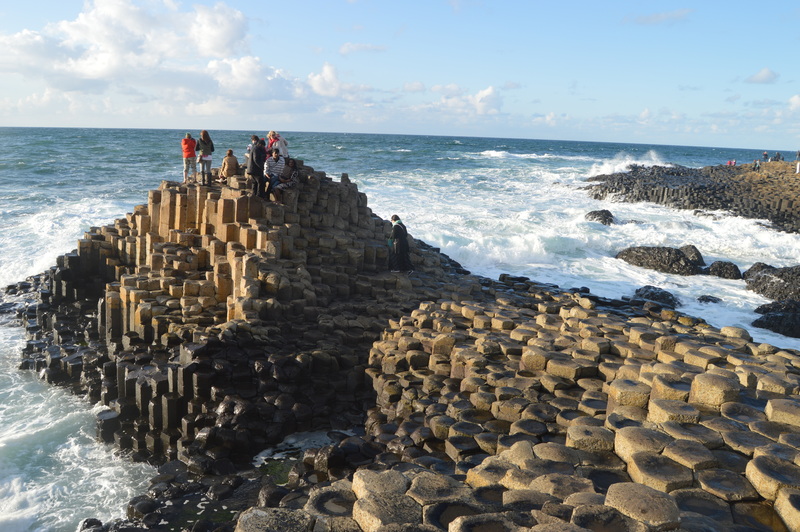 The next day I caught a bus for the Giant’s Causeway with McCombs Tours (only $31!) and we headed up the Coastal Route, which is on more than a few suggested Bucket Lists. I was expecting cold grey water and stormy skies, but what I saw was closer to a tropical island. I mean, it was still cold as balls, but it was almost as blue as the Adriatic. I was like a giant owl, just spinning my head around and around, trying to take everything in. 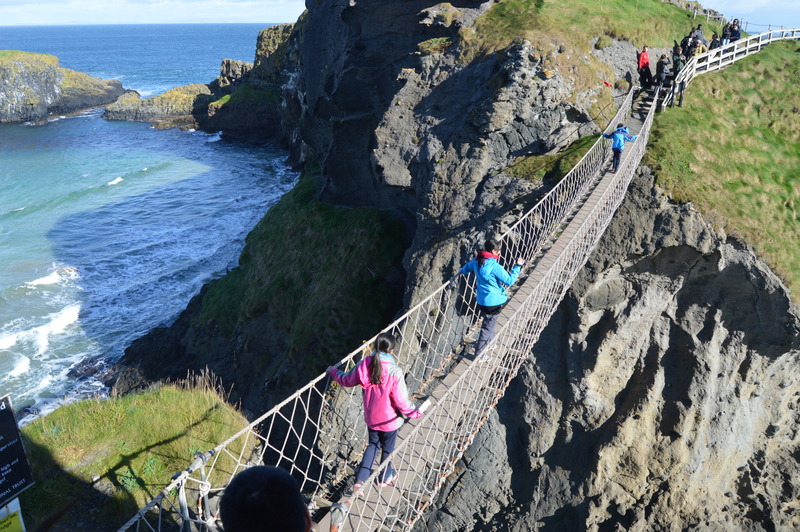 We made a few quick stops for pictures at Carrickfergus Castle and Dunluce Castle, but the first main port of call was the Carrick-a-Rede rope bridge about an hour north of Belfast. It’s an old bridge linking the mainland to a tiny island where fishermen used to cast their nets, and you can cross it for a small fee (five pounds or so, maybe less). By this point I had made an American travel buddy named Sherman, and when we arrived we took our bus driver’s advice and immediately went for the bridge itself instead of taking pictures of the scenery. This turned out to be an excellent idea, because only ten people are allowed to cross at a time, and the sides have to take turns because the bridge is so narrow. There was a brisk wind, but I still felt extremely safe crossing (though it should be mentioned that people with a fear of heights or a nervous disposition should probably avoid the bridge entirely), and I even made the return trip with no hands so that I could film! This part of the coast is gorgeous, and we had a great time exploring every inch of the little island before waiting our turn to come back. On the way over we saw several members of our tour group who hadn’t even made it to the front of the line yet because they took pictures on the way there. Hint: the pics are just as spectacular when you take them on the return hike. It’s definitely a bit of a climb up and down the hillside, but if you’re reasonably fit then it’s probably well within your abilities. I won’t be winning any marathons in this lifetime, and I managed it just fine. The drive north continued to be breathtaking. Our driver told us all about the history of the area, and he slowed down over bridges and through incredible glens so that we could take pictures. 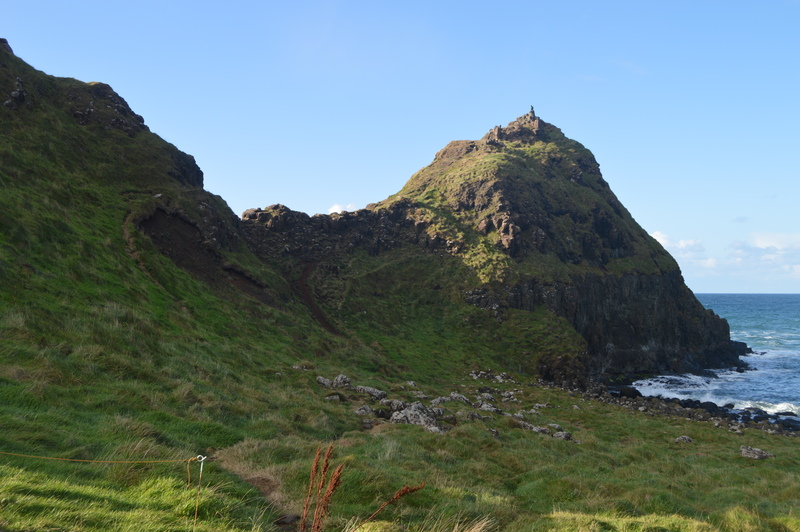 By far my favorite story was the true tale of the Giant’s Causeway, which you can read at this link: http://www.causewaycoastandglens.com/Folklore-and-Legend.T1153.aspx. Our next major stop was the Bushmills Distillery, where we had a delicious lunch break. If you ever visit, I highly recommend their steak-and-Guinness pie and a delicious hot Toddy. You’re supposed to order all alcohol from the restaurant portion and not the bar area (weird, I know) but most of the bartenders seem more than happy to give you a small sample of one of their whiskeys. I myself had the 16 year reserve, and let me tell you: that b*tch has a bite. She spent about a second checking it out and then said, “Let’s do it.” So we climbed up to the dip (which was honestly the hardest part because of the long, slick grass and the high angle of the rock face), and kept going until we reached the cluster of rocks at the peak. The fruits of our success were pretty amazing: gorgeous 360 degree views of the coastline, including a dark grey haze in an otherwise clear sky. After exploring and relaxing for a few minutes, I looked down the far side of the cliff face and noticed that it seemed to connect quite easily to the dip in the middle, so naturally I tapped Sherman on the shoulder and said, “I bet we can make it down there,” and she agreed. Is anybody else sensing a pattern? For a fit hiker like Sherman it was an easy climb down, but after a few seconds it became obvious to me that I was in trouble of slipping on that grass, which was easily as long as my forearm and full of sea spray. My solution was to sit down and just slide down to the bottom, giggling the whole way. It was totally worth the wet jeans. As we continued exploring, I felt the first drops of water hit my face. The grey haze that we had spotted earlier had made its way over, and for a minute it poured on us as we shrieked and tried to run along the side of the promontory. Soon enough it cleared away, and from the top of the dip Sherman called down to me, saying that there was a rainbow. I thought that it was like the small ones we had seen a few times on the drive up, but when I stood beside her and looked down I was completely floored by the sight of a full, glorious rainbow over the beach not 500 meters away. Actually, my reaction involved a lot of four letter words that I shan’t be repeating here. After all the requisite pictures, we sat down on the edge of the cliff and dangled our feet over just to enjoy the view. I don’t really have the proper words to describe the Giant’s Causeway itself. Being there was a deeply spiritual experience for me, and even though I initially laughed when the bus driver said that we had three hours, I used every second of it. The hypnotic sound of the waves lulls you into a state of perfect peace while the rich visual landscape fires up your imagination like rocket fuel. If the weather permits, I highly recommend taking your shoes off and exploring the stones with your bare feet. It’s actually very comfortable; the “steps” are large and smooth, allowing for easy walking unless you have to cross the patches of smaller rocks. Be careful where you sit though, because I chose a spot a little too close to the waves and got my feet just a bit wet. It feels like I have less to say about the Causeway, but the truth is that I simply did a lot of sitting, a lot of exploring, and a lot of looking. It’s anti-climatic compared with our earlier adventures, and that’s okay; it certainly doesn’t mean we were any less affected. Being on that incredible coastline made me feel strong and clean, like all the little rough parts of me were being smoothed away by the waves. How’s that for dramatic? The return trip to Belfast was quiet, and my night was filled with easy conversations and games of pool at the hostel. Seriously, Vagabonds is a fantastic place: the atmosphere is warm, it has common areas like a living room and beer garden, and plenty of bathrooms/showers. The next morning, Sherman and I set out to explore the city. We walked by the Grand Opera House and the beautiful city hall, stopping at the Titanic memorial and even popping in to a coffee festival. The St. George Street Sunday market was unbelievable; it had homemade soaps and candles, antiques, jewelry, clothes, cupcakes, paella—just rows and rows of booths waiting to be discovered. If you visit Belfast on a Sunday, I highly recommend it. 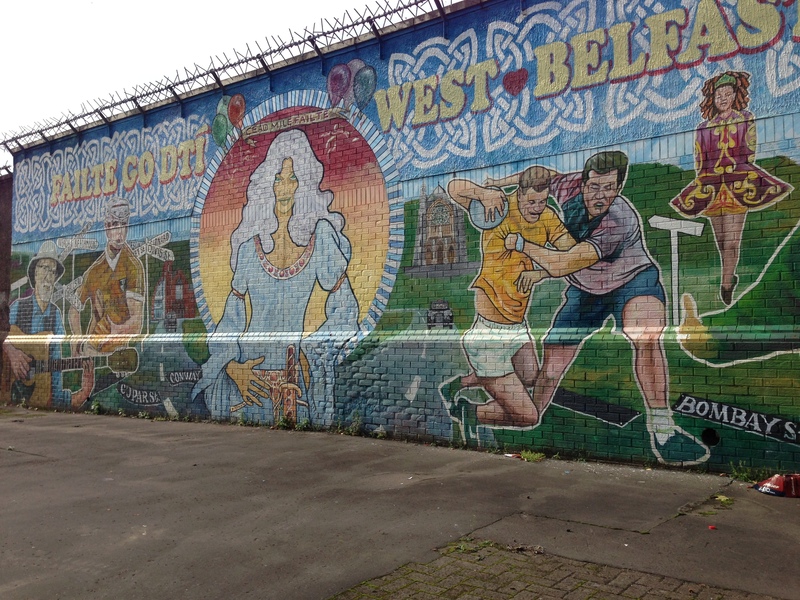 All in all, Belfast was definitely worth the visit. The city itself has recovered well from the violence and conflict of the last few decades, and until my trip I thought that nothing could beat the west coast for sheer wild beauty, but I was wrong. So travel often and travel well, my dears, and give Belfast the chance it deserves.